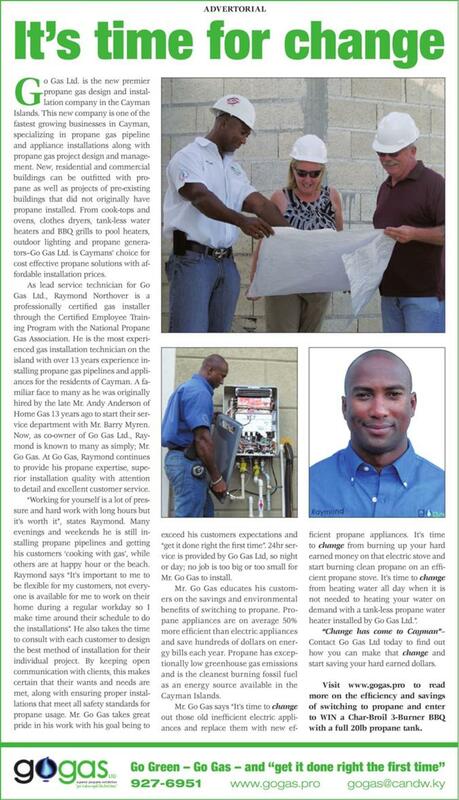 Go Gas Ltd. is the Premier Propane Gas Design and Installation Company in the Cayman Islands. From cook-tops and ovens, water heaters and generators to outdoor lighting and BBQ grills - Go Gas Ltd. is your choice for cost effective propane solutions with superior installation quality. No job is too big or too small for Go Gas to install! Our professional staff are properly trained and certified through the National Propane Gas Association and comply to all local laws and codes. Go Gas Ltd. will meet all of your residential or commercial propane installation needs, including new and retrofit projects. For your safety and peace of mind, choose the most EXPERIENCED Propane Gas Installation Technicians in the Cayman Islands at: Go Gas Ltd.
At Go Gas, we "get it done right the first time" with the goal of exceeding our customers' expectations. Call today to speak with a Go Gas representative for a FREE consultation and estimate. Pay us Online with Bank of Butterfield Online payments. It's fast and easy, just a few clicks away and you can pay your Go Gas Ltd. invoices online with Bank of Butterfield. Click below to see how much GREEN$$$ you can save!! Mr. Go Gas wants to help you understand the benefits of switching to Energy Efficient Propane appliances from Electric Energy Guzzling appliances with the new Go Gas Energy Savings Calculator. This calculator will estimate how much you can save each year by switching to propane appliances. It lets you choose your appliance & your approximate amount of usage per month - then calculates how much you can potentially save each year by switching 1, 2 or 3 appliances to propane. On average, switching to propane can save you over 50% on energy bills. It will also estimate the amount of CO2 emissions saved by using propane instead of electricity as an energy source. Propane is the cleanest burning fossil fuel available in the Cayman Islands, producing less than 1/3 the amount of CO2 as electricity. That is like a size 5 Carbon Footprint instead of a size 15! Mr. Go Gas for a FREE estimate on installation. "Hi! Just wanted to share something. We recently had our propane tank topped up after 6 months of use. This includes a gas stove, gas dryer and the water heater we got from you. For a household of 6 people (who cook A LOT and have TONS of laundry)... our propane use cost CI$40.00 per month! NO JOKE! I about danced for joy! Absolutely incredible! Thanks again for a great install"
"We called upon Raymond to reconfigure our commercial gas connections. We found him to be knowledgeable, thorough, professional, fast, efficient, and available at short notice. His pricing was also very fair. Highly recommended!" " I used Go Gas and I am very happy with the service and professionalism and most of all the speed at which the job was done - Thanks Go Gas!" "The service Go Gas provided was excellent in every way. I would highly recommend Raymond and his team." "Your customer service is superb!!! So many companies in the construction industry now have poor customer service. It is great to find a company that cares and does the right thing. You will have my business for a long time to come." Hear what Go Gas can do for you today!